10 restauracja North Fish w stolicy już otwarta | North Food Polska S.A.
On 17 October, a new North Fish restaurant will open at Atrium Promenada in Warsaw. This is now the eighth restaurant in Warsaw and the 45th in Poland. The new restaurant offers products already known at our chain – Norwegian salmon, black cod, delicious soups, healthy sandwiches on rolls baked on-site, fresh smoothies and natural lemonades, as well as the chance to load up cold side dishes in the “all you can eat” format. Multi-format graphics will give the new restaurant a unique character, and modern equipment will ensure that products are of the highest quality every day. “North Fish needs no introduction in Warsaw. We’ve been here for 14 years, and customers appreciate our offer – excellent fish, seafood, home-made lemonade and great soups. North Fish at the Promenada will be the 8th in Warsaw, and the chain’s 45th. We chose the Promenada, because it’s a great project, and after its redevelopment it’ll be the absolute leader in this part of the capital,” says Tomasz Rurarz, Marketing and Development Director at North Food Polska S.A.
North Fish is a chain of restaurants specialising in fish, seafood and vegetarian dish. The first was opened in 2002 in the Galeria Echo shopping centre in Kielce. 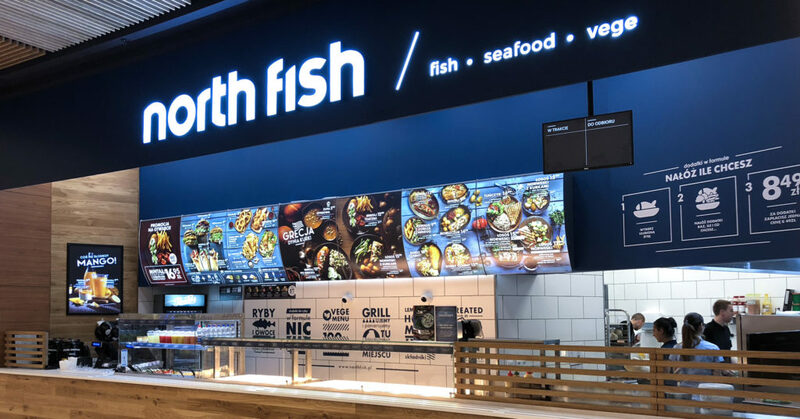 Currently North Fish operates 45 restaurants located in Poland’s best shopping centres, which makes it the country’s unquestioned leader and Europe’s second largest, chain of restaurants offering fish and seafood. Each day nearly 1,000 employees take care to ensure the highest quality of the products served.